This silver colored tallit clip is specially crafted to give it the antique look with the age-old Judaic symbol of the Lions of Judah. The design consists of two loins on their hind legs leaning on the Tablets of Stone. The Tablets of Stone are etched with the beginning of all Ten Commandments in Hebrew. 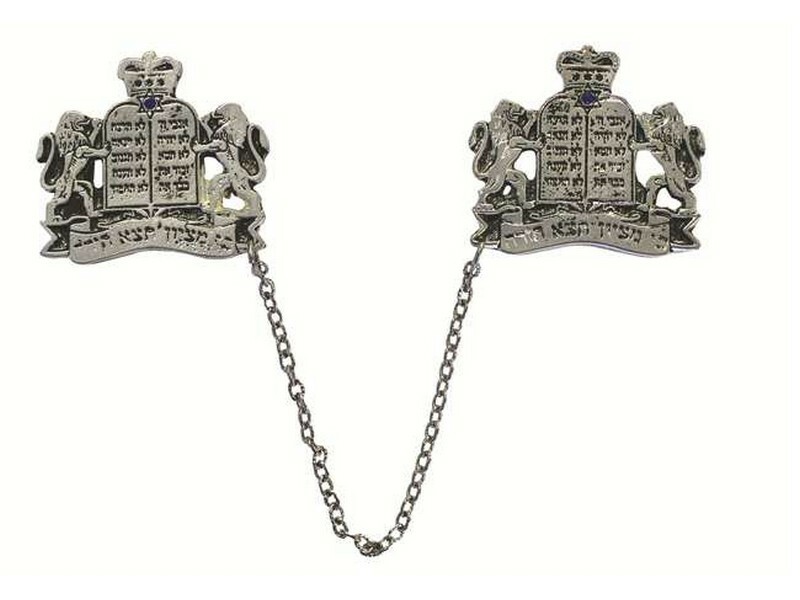 The bottom of the clip contains the Hebrew verse of “Ki mitziyon tzeitzei torah”, “From Zion will come forth the Torah” (Isaiah 2:3). There is a crown at the top center completing the design. Many people consider the tallit clip as an essential accompaniment to the tallit, especially when wearing a shawl style tallit. A tallit worn during services tends to slip and shift. This decorative tallit clip will keep your tallit in place and serve as a beautiful and classy adornment to your tallit.